Click to download a PDF version of this newsletter. So far, 2013 has been a hectic year for the North American machine tool market. South of the border, latest AMT statistics for the month of July show sales of 1,937 units with a total value of $341,191,000 – and an average value per unit of just over $176,000. Unit sales in July were almost 2% higher than in 2012. Machine tool unit sales in USA have grown for the last three months. AP reported at the beginning of October that US factory activity expanded in September at the fastest pace in the last 30 months – an encouraging sign that manufacturing could lift economic growth in the coming month. ISM (the Institute for Supply Management – a trade group of purchasing managers) has announced that its manufacturing index rose in September to 56.2, the highest since April 2011 (a reading above 50 indicates growth). The strength at factories has the potential to set the stage for even faster growth in the October – December quarter. Many analysts are forecasting the annual growth, in 2013, for the manufacturing sector at the very healthy rate of 3%. 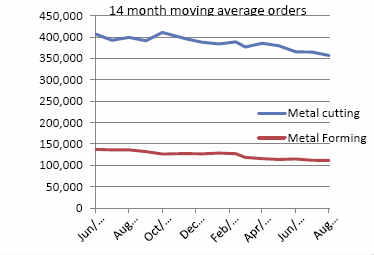 • Metal Forming (CNC and non-CNC) is down 11% in units and 19% in sales value. •Total net attendance: 7,576 (a 23% increase over the 2011 event). •Total net exhibit space: 127,555 sq.ft. (an increase of 18% over the 2011 event). • Total number of exhibitors: 390 (an increase of over 11% over the 2011 event). SME made great efforts and succeeded in showcasing the great technology and variety of equipment exhibited on the floor. Media exposure, the shuttle bus service, the speakers, conferences, and the student program, as well as the spectacular Avro Arrow display, have all contributed to the success of the show - appropriately called by many in our industry as ‘Canada’s National Manufacturing Event.” 70% of the floor space has been rebooked for the 2015 event. I would like to take this opportunity to welcome Luke Kerr of Amada Canada to the CMTDA board of directors’, Luke will replace Daniel Medrea of DMG/Mori Seiki/Ellison Technologies who has resigned from the board due to the pressure of work. Many thanks go to Daniel for his effort and support. The web based compensation survey is complete and should be ready to go shortly. As with statistics the information provided will be kept in strictest confidence and the compiled results will only be made available to those members that participate. Our AGM will be held on December 5th at the Country Club in Woodbridge. 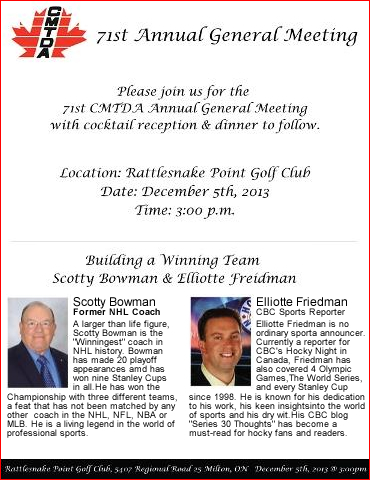 The hockey fans who have enjoyed Wendel Clark’s presence at CMTS, will have a great incentive to attend our AGM, as Scotty Bowman, the Hall of Fame coach will be our guest speaker along with Elliotte Friedman from CBC Sports who will discuss “Building a Winning Team” This should be an informative and fun evening. As we enter the very important last quarter of the year, I wish you all a most successful year end, and look forward to see you at the forthcoming AGM. Average order size for CNC metal cutting machinery YTD were as follows: horizontal lathes, $189,000, vertical spindle lathes, $282,000, multitasking lathes, $308,000 VMC up to 40” travel, $119,000, VMC above 40” travel, $225,000, VMC five or more axis, $496,000, horizontal machining centers, $448,000, horizontal machining centers 5axis, $1,465,000, milling machines , $58,000, horizontal and vertical boring machines, $617,000, wire EDM, $160,000, sinker EDM, $207,000, grinders, $218,000, CMM, $117,000, saws, $32,000, others, $144,000. 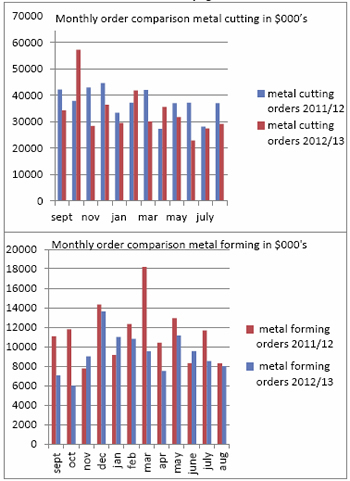 Average order size for manual metal cutting machines was $16,000. Average order size for CNC fabricating machinery were: press brakes, $135,000, shears, $57,000, turret punches, $454.000, profile cutting laser, $592,000, profile cutting plasma, $306,000, profile cutting water jet, $241,000, other lasers $489,000, tube benders, $12,000, others, $70,000. Average order size for non CNC fabricating machinery was $13,000 and for presses and equipment was $70,000. The spring meeting which took place at the sightlines restaurant in the Rogers Centre in June was a great success with almost 120 CMTDA members, spouses, friends and family in attendance. The buffet dinner was excellent and that along with an open bar made for a memorable evening. The weather was perfect with the roof open and bright sunny skies and the Blue Jays topped it all off by beating the Colorado Rockies handily. The 71st annual general meeting will be held at Rattlesnake Point Golf Club on December 5th 2013 and each member company will be allowed to send up to 2 participants at no charge. The start time will be 3.00 pm and the meeting will be followed by a cocktail reception and dinner. Please mark your calendar accordingly. An official invite will be forwarded by e mail shortly. The Canadian Machine Tool Distributors Association was founded in 1942 as a trade association dedicated to the marketing of machine tools and services in Canada through distributorship companies. To promote friendly business relations among its members. To provide means whereby challenges affecting the industry can be readily discussed and to co-operate, as a group, to further the interests of the industry by all desirable and lawful means. To collect and disseminate statistics on market capacity and other pertinent matters. To exchange information among members for the purpose of reducing distribution costs and eliminating waste and duplication of efforts. To enable the members, as a group, to discuss with the government, if need be, tariff concerns and other issues relating to machine tools. To promote and sponsor machining skills development for youth Canada-wide. Tejal Mehta, Emec Machine Tools Inc.
Stefan Schreiber, Trumpf Canada Inc.
L.S. Walker Machine Tools Inc.